3CECEP Green Carbon Environmental Protection Co., Ltd. This study investigated the methane production characteristics and the composition of microbial community during anaerobic monodigestion of three target substrates (chicken manure, pig manure and dairy manure) by semi-continuous digestion. The methane production of the dairy manure was only 0.49 L/d, while the chicken and pig manure was 2.24 L/d and 2.67 L/d, respectively. Barcoded pyrosequencing of the prokaryotic microbial 16S rRNA genes in the DNA showed that the active bacterial populations detected were those required for the hydrolysis of amended substrate, and the active archaeal populations belonged to methanogens of phylum Euryarchaeota, which were dominated by Methanosarcina. Principal coordinates analysis revealed that there were significant differences among the three single manures associated with prokaryotic communities, and the community structure of seed sludge was predominant in the adaptation of substrates. Overall, VFAs accumulation and methanogens reduction maybe lead to the decease of methane production of dairy manures. In China, there are 14,000 livestock and poultry farms, increasing with the speed of 10% every year, which raise over 5,000 pigs, 400 cows and 300,000 chickens. The rapid growth of breeding farms brings manure pollution resulting in producing harmful gases and contaminating groundwater . Therefore, utilizing manure is of great significance to improve the environment and resources recycling. The anaerobic digestion (AD) process is an effective way to digest manure and produce renewable fuel and nutrients for agriculture. AD consists of a series of reactions, which are driven by a mixed group of microbes and convert organic matter to methane-rich biogas in a stepwise fashion. In recent years, biogas plants have gotten more and more attention and develop rapidly in China . Contrary to using co-digestion in American and European (or western) countries, biogas plants in China usually use mono-digestion, e.g. pig, dairy or chicken manure as the substrate for AD based on the local manure availability. AD using different manure substrates encounters different problems, such as long start-up time, low methane yield or process instability. These problems cause anaerobic digester failing and bring economic losses for the biogas plant. So far, many studies have been carried out to elucidate these problems; however, most of them were established on batch-scale AD [3-7]. A full-scale biogas plant usually uses semi-continuous AD, which includes a washout of activated sludge during the process. The washout procedure should bring dynamic changes in physical and chemical properties as well as microbial commuities that are essential factors for an AD system . In oder to improve the AD process perdormance, it’s necessary to find the microbial communities comparison of different substrates in the same operation conditions [9-12]. The AD is a complicated process including hydrolysis, acidogenesis, acetogenesis and methanogenesis. As is known for us that bacterial Phyla Proteobacteria, Firmicutes, Bacteroidetes, Chloroflexi, and Methanogens such as Methanomicrobiales and Methanosarcinales are the most representative members involved in the anaerobic digestion. But these researches carried in a single batch-scale co-digestion system, and the real-time comparison in different single manure was lacked [13-16]. Previous studies have showed that the substrates maybe the key factor to affect the microbial community structure, which will result in the differences of methane production and system stability in vary mono-manure digestion progress . In this work, we taken chicken manure, pig manure and dairy manure, three of the most common manure in China, as semi-continuous AD feedstock for biogas production, and investigated the methane production in the three mono-manure digestion process as well as tested the dynamic changes of VFAs and total ammonia nitrogen (TAN) concentrations, prokaryotic community structure under the same operation condition. By using the different mono-manure digestion system, we aimed at (i) examining the methane production and physiochemical characteristics, (ii) determining the dynamic changes of prokaryotic communities, (iii) revealing the correlations between digestion performance and prokaryotic community structure. This study clearly explained the AD characteristics during three mono-manure digestion system, and it would provide a brand new understanding of the implementation of biogas plants. Chicken manure, pig manure and dairy manure obtained from local farms in Shuangliu, Sichuan, China, and stored at 4°C. The sludge was taken from an anaerobic digester that inoculating with pig manure in a local biogas demonstration village in Shuangliu, China. The substrates and sludge were individually homogenized for further use. The chemical characteristics of the substrates and the sludge are shown in Table 1. The experiment was conducted by using four same 6 L digesters, each for chicken manure, pig manure, dairy manure, and control respectively. A schematic diagram of the digester is given in Figure 1. The digester was made of plexiglass, the height of the digester is 34 cm, the inner diameter is 15 cm, and the working volume is 4.8 L. The feeding inlet was set on the side of the reactor at the height of 2 cm, with an inner diameter of 1.5 cm. Moreover, the digester was operated at temperature of 352°C with control of a temperature sensor, a heater band and a thermostat. At the starting of the experiment, 4.8 L of the sludge was inoculated into the four digesters separately. After 7 days start-up, these digesters were initiated in a semi-continuous mode and the three digesters were fed with chicken manure, pig manure and dairy manure, respectively. The fourth with no discharging and feeding was set as control. Digesters were firstly mixed by stirring motor for 20 min at 50 rpm prior to discharging and feeding at 10 am every day, with a conservative organic loading rate at 7.0 g/L and hydraulic retention time of 30 d. The second mixed time was carried at 10:30 pm with the same mode gas volume recorded by the flowmeter. These Digesters were sealed by water. Pressure in the digester was monitored by the manometer. These semi-continuous digesters were operated for 33 days. The amount of biogas produced from each digester was recorded by using a gas flow-meter (LML-1, China) each day. Methane content in biogas was measured by a gas chromatograph (GC) (Agilent 7890A-TCD, USA), the detector was TCD and the temperatures of the inlet and detector are both 100°C, the column was GDX-01 with the temperature was 80°C. And the flow rate of the carrier gas H2 was 8.78 mL/min and the concentration was determined according to a calibration curve. The total solid (TS) and volatile solid (VS) contents were determined using standard methods (APHA, 1998). Samples were collected on the day of 10, 15, 21, 27, and 32, then the samples centrifuged at 4800 r/min for 10 min and the supernatant was measured for VFAs and TAN. VFAs (acetic acid, propionic acid, butyric acid and valeric acid) were measured by GC (Agilent 7890A-FID, USA), we used FID detector, FFAP column, and the temperature of them were 250°C and 140°C respectively. The carrier gas was N2, and the flow rate of it was 27 mL/min, then, the flow rates of hydrogen and air were 43.9 mL/min and 159 mL/min, the data was the sum of all acids. TAN was tested according to standard methods (APHA, 1998). The pH of the digester was measured every two days using an acidometer (PHS-3C, DAPU, China). Samples were taken on the day of 3, 10, and 21. The total DNA was extracted by CTAB grinding method . For getting high throughput sequencing, the 16S rRNA genes were amplified using procaryotic universal primers 515F (5′-GTGYCAGCMGCCGCGGTA-3′) and 909R (5′-CCCCGYCAATTCMTTTRAGT-3′) (targeting V4-V5 region in 16S rRNA gene) with a 10-mer barcode at the 5′ end of primer 515F . The detailed PCR conditions were as described in this article . The barcoded amplicons were pooled with equimolar concentrations of the samples and sequenced using a Miseq platform (Illumina Inc., San Diego, CA). The raw sequences were sorted based on a unique sample barcodes, trimmed for sequence quality, and denoised by the QIIME pipeline . Chimera sequences were removed using the UCHIME algorithm . Next, the sequences were clustered by the complete-linkage clustering method incorporated in the QIIME pipeline. Operational taxonomic units (OTUs) were classified using 97% identity of the 16S rRNA gene sequence as a cutoff. The Shannon diversity index and Chao1 estimator were calculated at 97% sequence identity in the Ribosomal Database Project pipeline (RDP) (http://pyro. cme.msu.edu/). The phylogenetic affiliation of each representative sequence was analyzed with the RDP classifier at a confidence level of 80%. A phylogenetic-based unweighted UniFrac distance metric analysis, principal coordinate’s analysis (PCoA), was conducted for evaluating the differences of microbial community structures . The performances of the digesters fed with chicken manure, pig manure or dairy manure were evaluated based on the daily concentration and volume of methane production (Figure 2). As can be seen from Figure 2A, the overall trend in methane concentration was pig manure>chicken manure>dairy manure. There were no great fluctuations between pig manure and chicken manure in digestion, basically maintained methane concentration at about 55%. However, the methane concentration of dairy manure fluctuated a little before day 7, was 53 ± 2%. Then it showed a downward trend, and stayed at around 27% from day 16. What’s more, the daily volume of methane in digester with dairy manure was not high (Figure 2B). The change of daily methane volume agreed with that of methane concentration for the three kinds of manures (Figure 2B), and the control digester with no discharging and feeding produced negligible amount of methane, which was not shown in the Figure 2. For chicken manure, average daily methane production was 2.24 L, showing a steady upward trend before day 24, and then falling slightly after day 24. It reached a peak of 3.1 L on day 24. The average daily methane production of pig manure is 2.67 L, which was instable before day 10. After day 20, it became relatively stable with a peak of 3.57 L on day 23. As to the daily methane production of dairy manure, it was averagely only 0.49 L. After day 7, the methane production of dairy manure fell sharply, and then stopped declining from day 16 with a peak appeared on day 1 for 1.54 L. For further explanation of the differences between dairy manure and the other two substrates, TAN, pH and VFAs was tested along with the digestion going on. 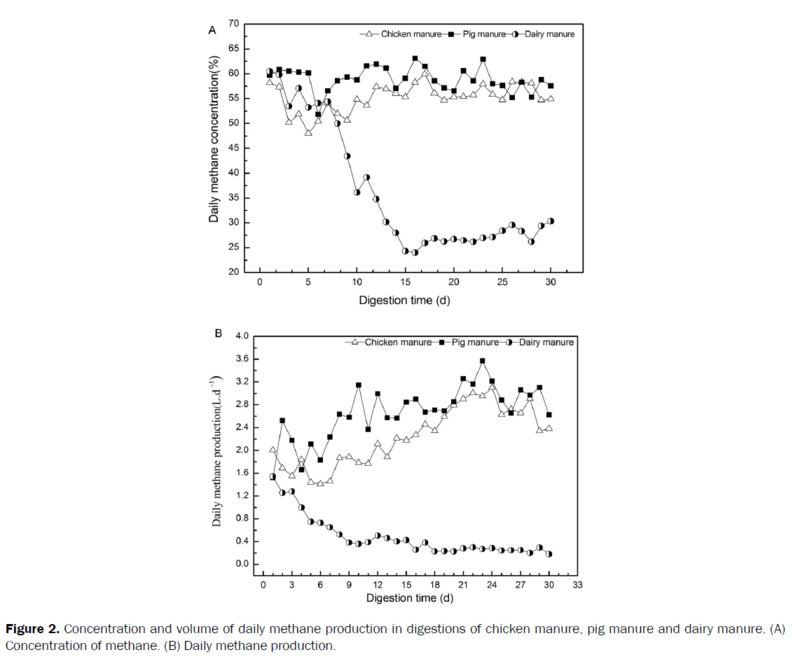 Figure 2: Concentration and volume of daily methane production in digestions of chicken manure, pig manure and dairy manure. (A) Concentration of methane. (B) Daily methane production. As shown in Figure 3A and Figure 3B, the changes of VFAs and pH in the digesters with three different substrates represented the similar pattern with methane production, VFA and pH values in chicken and pig manure maintained about the same through the whole process, while the concentration of VFAs increased and pH decreased rapidly in dairy manure, the pH declined sharply, resulting the surrounding was not suitable for the growth of microbial, which would explain that dairy manure had a low methane production after 7 days. Methanogens are active at pH between 6.2 and 8, but optimally at pH 7.0-7.2 , and possibly the lower pH inhibited the methanogen in dairy manure. Normally, the dairy manure digestion process is stable owing to the abundant indigenous methanogens of dairy manure. Hence, one reason for this may be the overused antibiotics leading to the high concentrations of antibiotic residues in the dairy manure , causing an inhibitory effect on methanogens , and resulting in the poor performance of methane production. Another reason for this may be the insufficient ammonia alkalinity during the digestion process leading to lacking neutralization of VFAs, which caused pH drop, thereby affecting the growth of methanogens, ultimately resulting in the poor performance of methane production. Figure 3: VFAs concentration, pH values and TAN concentration in digestions of chicken manure, pig manure and dairy manure. (A) VFAs concentration. (B) pH values. (C) FAN concentration. In Figure 3C, TAN concentrations varied greatly in digestion with different substrates, where chicken manure had the highest concentrations of TAN, followed by pig manure, and the dairy manure was the lowest. TAN consisted of NH4+ and free ammonia (FA), the NH4+ was not harmful to the cell, but FA has been suggested as a main inhibitor. FA was freely membrane-permeable; it will diffuse passively into the cell and then cause proton imbalance and potassium deficiency [25,26]. In this work, TAN concentration increased gradually along with the digestion of chicken manure, reaching 3411 mg/L on day 32, and the concentration of FA in chicken manure was 202 mg/L, calculated by formula(1). The relative abundance of Methanosarcina in chicken manure is the highest, and its tolerance to FA is 700 mg/L , so it did not exhibit TAN inhibition in the digestion process, which was consistent with the observation of this article . For pig manure and dairy manure, there were no big changes with TAN concentration. So the TAN concentration might not be the main reason for the bad performance of dairy manure AD. Where (FA) is the concentration of free ammonia. CA is the concentration of TAN, KA is the dissociation equilibrium constants for NH3, pKA is 8.9 at 37°C, (H+) can be calculated by pH. Amplicon pyrosequencing of the prokaryotic microorganism 16S rRNA genes was applied to determine the microbial community structure of the samples from the digestion of three kinds of manures. In order to determine the taxonomic affiliation of the community members, all qualified reads from each sample were assigned to their respective taxonomic ranks from phylum to genus levels. The relative abundance of prokaryotic microorganism in samples at the phylum level is shown in Figure 4A. Overall, the sequences were found to be associated with nine known phyla and about 14% of the sequences in each sample could not be classified to a known phylum (Figure 4A). Bacteroidetes and Firmicutes were the two most abundant phyla in all the samples, accounting for 45-70% of all sequences (Figure 4A). Bacteria of the Bacteroidetes and Firmicutes phylums have been widely observed as acid-forming bacteria that degrade cellulose and protein [29-33]. This observation agreed with previously described bacterial communities in anaerobic digesters in which Firmicutes were typically the predominant phylum [18,34]. The other major phyla in the samples included Proteobacteria, Euryarchaeota, Spirochaetes and Synergistetes, while the minor phyla were composed of Actinobacteria, Planctomycetes, and Chloroflexi. During chicken manure digestion process, a shift was noted in the active community structure with Euryarchaeota, decreasing from day 3 (22.1%) to day 10 (17.3%), and increasing to 24.5% on day 21. Whereas the proportion of Euryarchaeota in dairy manure digestion decreased significantly from 22.9% on day 10 to 0.8% on day 21, and that of pig manure digestion increased significantly from 2.4% on day 3 to 34.3% on day 21, suggesting that prokaryotic microorganism with different metabolic functions became the key players during the transformation of chicken manure, pig manure or dairy manure. As known, all methanogens belong to the phylum Euryarchaeota . Considering the shift of proportion of Euryarchaeota from 22.9% on day 10 to 0.8% on day 21, the further reason for the poor performance of dairy manure digestion was that the balance of metabolic chain was broken owing to decreasing sharply on dominate methanogens of phylum Euryarchaeota. Figure 4: Relative abundance of prokaryotic microorganism 16S rRNA gene from the samples on day 3, 10, and 21 of chicken manure, pig manure and dairy manure according to classification by RDP at the (A) phylum and (B) genus levels. Results at genus levels are shown in Figure 4B. The differences in relative abundance and composition were observed between time and type of the samples, with a total percentage of less than 40% for the classified prokaryotic microorganism members. Generally speaking, the relative abundance of microorganism from genus Methanosarcina was the highest (14.7- 23.5%), except samples from pig manure on day 3 and dairy manure on day 21(<1%). Although the relative abundance of microorganism from genus Methanosarcina decreased in the two manure sample, the methane production of pig manure did not reduce as that of dairy manure. Possible reason for this might be that other methanogens appeared as functional strains on methane generation not dropping for the digestion process of pig manure. In the active populations of the respective samples, Clostridium was the most prevalent genus detected, accounting for 2.5-5.9% (Figure 4B). The genus Clostridium includes a number of species that are known to hydrolyze complex polymeric compounds  and results here showed that these bacteria contributed to the transformation of chicken manure, pig manure and dairy manure. The prevalent genus identified including Ruminofilibacter, Pelotomaculum, Syntrophomonas, Sedimentibacter, and Treponema. Members within the genus Syntrophomonas, such as Syntrophomonas wolfei participate in the syntrophic oxidation of butyrate to acetate for the subsequent consumption by the acetoclastic methanogens . Other typical strains of genus Syntrophomonas, such as Clostridium ultunense and Syntrophaceticus schinkii take part in syntrophic acetate-oxidising pathway with hydrogenotrophic methanogens [38,39]. A lag time is required to achieve stable performance of AD, and the balance of different groups of microorganisms in the digester is established during this time [40-42]. Therefore, the inoculation of the seed sludge from a digester with a stable operation is often applied to accelerate the start-up of a new digester, even if the types of substrate in the previous and the new digester differ from each other. If the seed sludge is introduced into a digester treating different types of substrate, the microbial community may change with the progress of the acclimation stages from the previous substrate to the new substrate. The researchers  successively analyzed methanogenic communities in three anaerobic digesters treating with different types of wastewater by inoculating the seed sludge from municipal wastewater. In this study, the seed sludge was taken from the same digester. Therefore, with all other conditions being held constant, the types of substrate was the main factor driving the emergence of different active microbial members to carry out hydrolysis, acidogenesis, acetogenesis and methanogenesis in the respective substrates. As it was known, methane production was completed by methanogens belonging to phylum Euryarchaeota. Thereby, the composition of the methanogens at genus level was further investigated to evaluate microbial performance (Figure 5). At genus level, Methanogens was predominantly composed of Methanosarcina, Methanobrevibacter, Methanosphaera, Methanobacterium, Methanoculleus and Methanosaeta. Methanosarcina was the most abundant archaeal genus in three manure digestion systems. However, there were different changes in Methanosarcina during the three manure digestion processes. To chicken manure digestion system, the methanogenic community was overrepresented by the Methanosarcina of relative abundance 19.45% on day 3, decreased to 12.75% on day 10, and then increased to 22.38% on day 21. To pig manure digestion system, the methanogenic community was overrepresented by the Methanosarcina of relative abundance 1.72% on day 3, increased to over 18% over the following days. Whereas, the relative abundance of Methanosarcina fluctuated wildly in dairy manure digestion system. It increased from 17.48 to 21.36% by day 3 to 10, decreased sharply to 0.59% on day 21, which caused the unbalance of metabolic chain of methanogenesis in dairy manure digestion. As a consequence, the dairy manure digestion system showed low amount and concentrations of methane production. According to the previous studies, the three main substrates which can be utilized by methanogens are CO2, acetate and methyl-group compounds . Based on the substrate utilization, the methanogens are divided into three groups, hydrogenotrophic methanogens, acetoclastic methanogens, and methylotrophic methanogens. Hydrogenotrophic methanogens and acetoclastic methanogens are the most common in the digestion of agricultural waste [24,44]. Representatives of the Methanosarcina and Methanobrevibacter have already been detected with great amounts in digesters and biogas plants [45,46]. Figure 5: Relative abundance of methanogens 16S rRNA gene from the samples on day 3, 10, and 21 of chicken manure, pig manure and dairy manure according to classification by RDP at the genus levels. In our study, acetoclastic methanogens, Methanosarcina and Methanosaeta, and hydrogenotrophic methanogens, Methanobrevibacter, Methanosphaera, Methanobacterium and Methanoculleus were detected in the three manure digestion processes, suggesting there are two methanogenetic pathways co-occurring to product methane. However, it's found that the three manure digestion systems were dominated by the genus Methanosarcina, and the acetoclastic methanogens were responsible for approximately 70% of the methane production in biogas reactors . This result was consistent with founding by Li  who reported that acetoclastic methanogenesis may be the major pathway in certain systems, or both pathways were utilized for methanogenesis. Therefore, combing with the VFAs concentrations in dairy manure digestion process, it may be concluded that the accumulation of VFAs was caused by the insufficient of ammonia alkalinity in dairy manure, which decreased the pH, thereby affecting the growth of acetoclastic methanogens and Methanosarcina, finally resulting in the bad performance of methane production. Unweighted Unifrac analysis was used in this study, which indicated that the respective active bacterial and archaeal samples were distantly related with each other as illustrated on a two-dimensional PCoA plot (Figure 6). Analysis of variance further verified that the differences between the respective active bacterial and archaeal samples were statistically significant (p<0.01). What’s more, the Unifrac comparative analyses indicated that the specific groups between active bacterial and archaeal populations were involved in the transformation of every amended substrate. The differences in prokaryotic communities among different samples were also demonstrated by principal coordinates analysis (PCoA). It showed a distinct community structure of pig manure on day 3, chicken manure on day 10 and dairy manure on day 21 (Figure 6), indicating significant variations (p<0.001) among the three kind of manure associated prokaryotic communities. 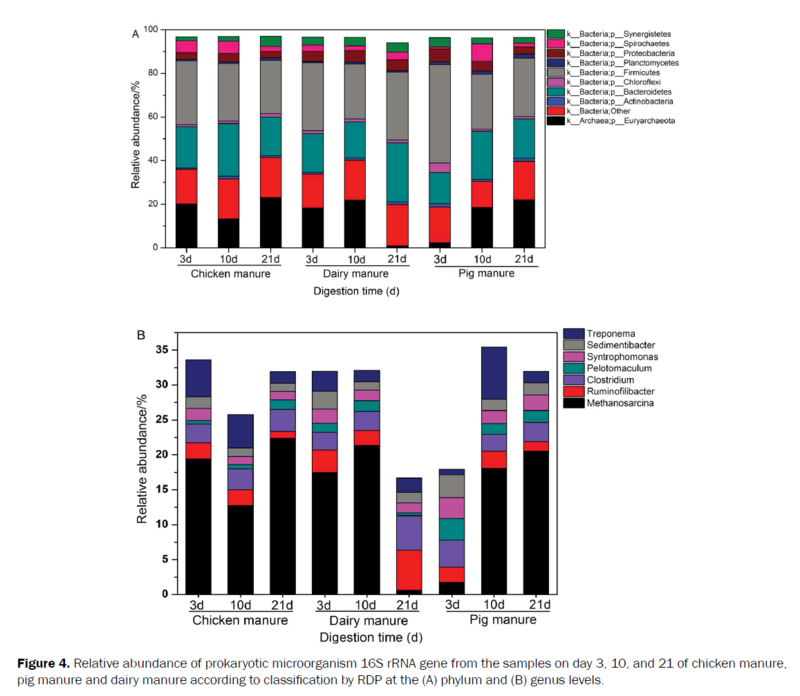 In contrast, chicken and dairy manure samples were clustered relatively closer than those from pig manure samples, which indicated a more dynamic change of prokaryotic communities in pig manure than that associated with the other two manures. Apparently, on day 3, the initial stage of digestion, the sample of pig manure was separated from other two manures, which revealed that the indigenous microbes in pig manure substrate greatly transformed the community structure of seed sludge. After some time, on day 10 and 21, the stable stage of digestion, all samples except dairy manure on day 21 were closely clustered, which demonstrated that the community structure of seed sludge was predominant with the adaptation to substrates. Thus, it is concluded that the qualified seed sludge is important to supply activated microbes in mono-digestion system. Thereby, aiming at mono-digestion process of biogas plant in China, high-performance seed sludge ought to be guaranteed, but the changes of pH should be closely monitored during the whole digestion process. Figure 6: Microbial phylogenetic distances between samples on day 3, 10, and 21 of chicken manure, pig manure and dairy manure as determined by an unweighted UniFrac PCoA. In this study, the physiochemical and prokaryotic community characteristics of AD were systemically investigated during the digestion process of three single manures. Overall, compared to dairy manure, chicken and pig manure obtained a higher methane yield of more than 2 L/d. And the prevalence of different microbial members in mono-digestion system has been shown to be dependent on the qualified seed sludge. Thus, to biogas plant in China, high-performance seed sludge should be guaranteed, but the pH change of feedstock with insufficient ammonia alkalinity such as dairy manure should be closely monitored during the whole digestion process. The authors would like to acknowledge financial support from the National science and technology support program projects of China (2014BAC31B01 and 2014BAD24B01) and Technology Service Network Initiative (STS) of Chinese Academy of Sciences (KFJ-SW-STS-175 and KFJ-EW-STS-121). Liu JH, et al. Position and Effect of Biogas Fermentation System on Control of Agricultural Non-point Source Pollution. Mod Agri Sci Technol. 2013;16. Maraseni TN and Maroulis J. Piggery: from environmental pollution to a climate change solution. J Environ Sci Health B. 2008;43:358. Abouelenien F, et al. Improved methane fermentation of chicken manure via ammonia removal by biogas recycle. Bioresour Technol. 2010;101:6368-6373. Borowski S, et al. Anaerobic co-digestion of swine and poultry manure with municipal sewage sludge. Waste Manag 2014;34:513-521. Chen JH, et al. Potential of methane production by thermophilic anaerobic co-digestion of pulp and paper sludge with pig manure. J Biobased Materials & Bioenergy. 2013;7:300-304. Ferreira LC, et al. Thermal steam explosion pretreatment to enhance anaerobic biodegradability of the solid fraction of pig manure. Bioresour Technol. 2014;152:393-398. Lar JS, et al. The influence of calcium and iron supplementation on the methane yield of biogas treating dairy manure. Energy Sources Part A Recovery Utilization & Environmental Effects. Part A: Recovery. 2010;1651-1658. Niu JL, et al. Effect of Biogas Production Characteristics of Dry Anaerobic Fermentation of Wheat Straw Pretreated by a Microbial Community with High Cellulose-Degradation Ability. Advanced Materials Research. 2011;347:2996-3000. Yousheng L, et al. Application of PCR-DGGE to analyzing bacterial communities in culinary waste compostPCR-DGGE. 2007;27:1151-1156. Zhang C, et al. The anaerobic co-digestion of food waste and cattle manure. Bioresour Technol. 2013; 129:170-176. Yin D, et al. 2014. Anaerobic digestion of pig and dairy manure under photo-dark fermentation condition. Bioresour Technol. 2014;166:373–380. Wu G, et al. A critical review on the bio-removal of hazardous heavy metals from contaminated soils: issues, progress, eco-environmental concerns and opportunities. J Hazardous Materials. 2010;174:1-8. Bareither CA, et al. 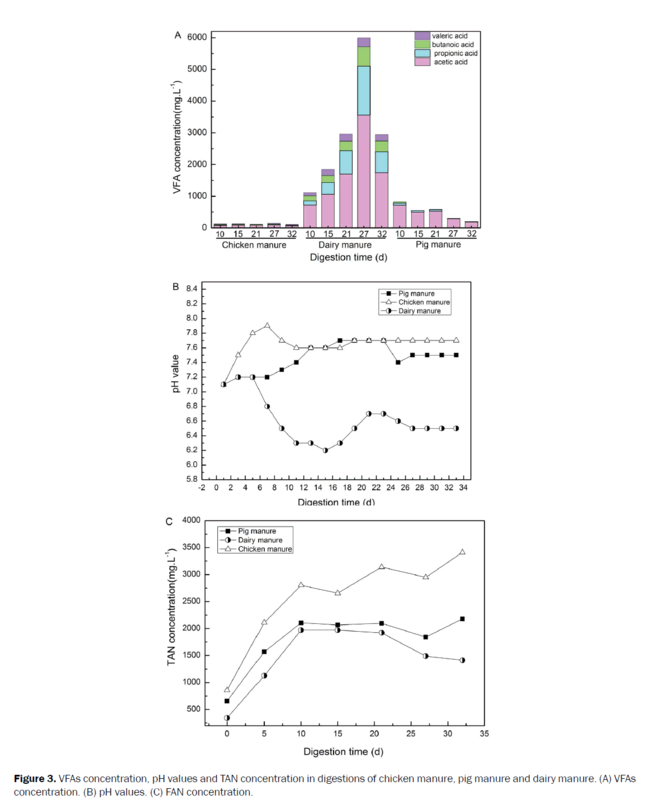 Microbial diversity and dynamics during methane production from municipal solid waste. Waste Management. 2013;33:1982-1992. Cater M, et al. Microbial community analyses in biogas reactors by molecular methods. Acta Chim Slov 2013;60:243-255. Chung YC, et al. Analysis of microbial diversity and optimal conditions for enhanced biogas production from swine waste anaerobic digestion. J Renewable & Sustainable Energy. 2013;5:053143. Niu QG, et al. Characterization of methanogenesis, acidogenesis and hydrolysis in thermophilic methane fermentation of chicken manure. Chemical Eng J. 2014;244:587-596. Lee C, et al. Quantitative analysis of methanogenic community dynamics in three anaerobic batch digesters treating different wastewaters. Water Research. 2009;43:157-165. Tamaki H, et al. Analysis of 16S rRNA Amplicon Sequencing Options on the Roche/454 Next-Generation Titanium Sequencing Platform. Plos One. 2011;6:e25263. Li X, et al. Dynamics of the bacterial community structure in the rhizosphere of a maize cultivar. Soil Biol Biochem. 2014;68:392-401. Caporaso JG, et al. QIIME allows analysis of high-throughput community sequencing data. Nat Methods 2010;7:335-336. Edgar RC, et al. UCHIME improves sensitivity and speed of chimera detection. Bioinformatics 2011; 27:2194-2200. Lozupone C and Knight R. UniFrac: a New Phylogenetic Method for Comparing Microbial Communities. Appl Environ Microbiol. 2005;71:8228-8235. Zhao L, et al. Residues of veterinary antibiotics in manures from feedlot livestock in eight provinces of China. Sci Total Environ. 2010;408:1069-1075. Jaenicke S, et al. Comparative and joint analysis of two metagenomic datasets from a biogas fermenter obtained by 454-pyrosequencing. PLoS One 2011;6:e14519. Sprott GD and Patel GB. Ammonia toxicity in pure cultures of methanogenic bacteria. Systemat Appl Microbiol. 1986;7:358-363. Gallert C and Winter J. Mesophilic and thermophilic anaerobic digestion of source-sorted organic wastes: effect of ammonia on glucose degradation and methane production. Appl Microbiol Biotechnol. 1997;48:405-410. Calli B, et al. Methanogenic diversity in anaerobic bioreactors under extremely high ammonia levels. Enzyme Microb Technol. 2005;37:448-455. Niu Q, et al. Mesophilic methane fermentation of chicken manure at a wide range of ammonia concentration: stability, inhibition and recovery. Bioresour Technol. 2013;137C:358-367. Whitehead TR, et al. Bacteroides coprosuis sp. nov., isolated from swine-manure storage pits. Int J Systematic & Evolutionary Microbio. 2005;55:2515-2518. Chen WM, et al. Fermentative hydrogen production with Clostridium butyricum CGS5 isolated from anaerobic sewage sludge. Int J Hydrogen Energy. 2005;30:1063-1070. Bertin L, et al. 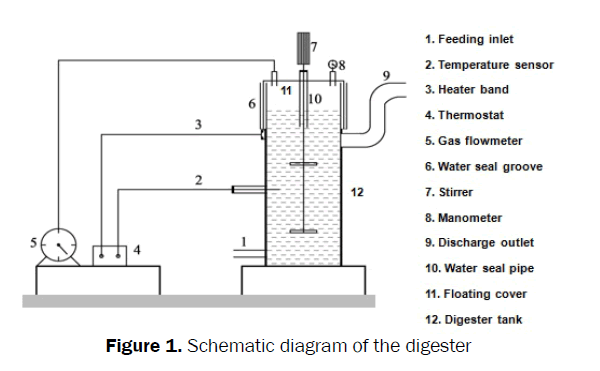 Performances and microbial features of an aerobic packed-bed biofilm reactor developed to post-treat an olive mill effluent from an anaerobic GAC reactor. Microbial Cell Factories. 2006;5:16. Lo Y, et al. Dark fermentative hydrogen production from enzymatic hydrolysate of xylan and pretreated rice straw by Clostridium butyricum CGS5. Bioresour Technol. 2010;101:5885-5891. Ntaikou I, et al. Valorisation of wastepaper using the fibrolytic/hydrogen producing bacterium Ruminococcus albus. Bioresour Technol. 2009;100:5928-5933. Nelson MC, et al. A meta-analysis of the microbial diversity observed in anaerobic digesters. Bioresour Technol. 2011;102:3730-3739. Paul K, et al. Methanoplasmatales,” Thermoplasmatales-Related Archaea in Termite Guts and Other Environments, Are the Seventh Order of Methanogens. Applied & Environmental Microbiology. 2012;78: 8245-8253. Tracy BP, et al. Clostridia: the importance of their exceptional substrate and metabolite diversity for biofuel and biorefinery applications. Current opinion in biotechnology. 2012;23:364-381. Mcinerney MJ, et al. Syntrophomonas wolfei gen. nov. sp. nov., an Anaerobic, Syntrophic, Fatty Acid-Oxidizing Bacterium. Appl Environ Microbiol. 1981;41: 1029-1039. Schnurer A, et al. Clostridium ultunense sp. nov., a mesophilic bacterium oxidizing acetate in syntrophic association with a hydrogenotrophic methanogenic bacterium. Int J Systematic Bacteriology. 1996;46:1145-1152. Westerholm M, et al. Syntrophaceticus schinkii gen. nov., sp. nov., an anaerobic, syntrophic acetate-oxidizing bacterium isolated from a mesophilic anaerobic filter. FEMS Microbiol Lett. 2010;309:100. Kobayashi T, et al. Characterization of start-up performance and archaeal community shifts during anaerobic self-degradation of waste-activated sludge. Bioresour Technol. 2009;100:4981-4988. Pandey PK, et al. Efficacies of inocula on the startup of anaerobic reactors treating dairy manure under stirred and unstirred conditions. Biomass & Bioenergy. 2011;35:2705-2720. Lins P, et al. Development and evaluation of inocula combating high acetate concentrations during the start-up of an anaerobic digestion. Bioresour Technol. 2012;110:167. Shima S, et al. Structure and function of enzymes involved in the methanogenic pathway utilizing carbon dioxide and molecular hydrogen. J Biosci Bioeng. 2002;93:519. Li A, et al. A pyrosequencing-based metagenomic study of methane-producing microbial community in solid-state biogas reactor. Biotechnol for Biofuels. 2013;6:1-17. Cardinali-Rezende J, et al. Molecular identification and dynamics of microbial communities in reactor treating organic household waste. Appl Microbiol Biotechnol. 2009;84:777-789. Mchugh S, et al. Methanogenic population structure in a variety of anaerobic bioreactors. FEMS Microbiol Lett. 2003;219:297-304. Ahring BK. Methanogenesis in thermophilic biogas reactors. Antonie van Leeuwenhoek. 1995;67:91-102.